A message from the Communications Committee. The HAPS video was released this week and it is a great snapshot of all that HAPS can do for its members. Using interviews of HAPS members to provide the narrative, the video showcases the ways in which people’s lives have improved because of their involvement in HAPS. 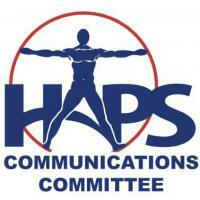 From promotions to new positions to getting questions answered on a daily basis, HAPS membership harnesses the power of our members to lift everyone to new heights. HAPS is well known for its Annual Conference. Every year a growing number of people come together to share four days of update speakers and workshops, as well as very productive time with exhibitors who share the latest in teaching resources and technology. And the HAPS Annual is a great conference to attend solo – everyone is happy to meet you, share what they know, and also maybe buy you a drink in the evening. People quickly go from acquaintances to friends. The HAPS Annual is great, and the more you are able to attend, the better they get. But there is so much more to HAPS that improves the lives of members all year round. The HAPS-L discussion group is an incredibly active email discussion group that solves real world problems for HAPS members on a daily basis. The HAPS “listserv” began in 1998 and has now matured into an online discussion group with a Google Group backend, while retaining its old school name. HAPS scholarships and grants make previously unattainable travel or research plans possible. Many cover expenses to attend the Annual Conference, but others reward using technology in the classroom or just plain old excellent teaching. And finally, among most important benefits of being a HAPS member is the career advancement that comes from being part of the HAPS community. HAPS has an extremely inclusive path to leadership and the video highlights both the ability to join leadership and the benefits that come from it. We invite you to watch the video and share it, especially with your A&P friends who are not HAPS members yet.